It’s a fact that as you grow older those years do start to show in your face. It’s a natural process, and it shouldn’t be a problem, but it can affect how you feel about yourself, and, as a result, your confidence lacks – especially if those signs start to show themselves before you feel ready for them! Today we’re taking a look at some of the most obvious signs of aging and what you can do about them to give you some options for restoring some of that vital confidence! 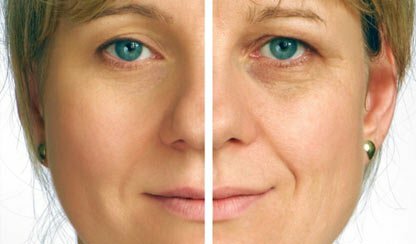 If there’s one thing driving the appearance of aging, it’s collagen. Collagen is responsible for your skin’s elasticity, it’s firmness and healthy plump appearance. Production of collagen wanes as the years pass, leading to, among other things, thinning of naturally full lips. Lip injections on thin lips can have dramatic results! From permanent silicone plumpers, to temporary hyaluronic acid fillers that are absorbed harmlessly by the body after a few months, you can customise your look, and how long it lasts. Technology marches on fast, so discuss your choices with an expert aesthetician to make sure you’re making the right choice for you. If you’re not keen on injections and willing to spend some extra preparation time before you head out, there are some non-invasive, cosmetic solutions to the problem, some of which also promise to help stimulate collagen production over time to help your lips regain a naturally full, rounded look. Similar symptoms, with a common cause, and fortunately, common treatments, these are all signs of the skin losing it’s elasticity thanks to the decline of collagen, the stress of exposure to pollutants, weather and internal toxins, and dry surface skin. They’re among the most obvious, visible signs of aging, so it’s well worth doing your research and coordinating a response. At the most dramatic, and effective, end of the spectrum, laser skin resurfacing can strategically remove the upper layers of your skin, to reveal the unstressed and unwrinkled surface beneath. Combining this with a skincare regime that helps to moisturise and add antioxidants to your skin will help you retain a youthful appearance for longer. You can also try to avoid extremes of cold weather that add stress to the skin, and perhaps most importantly for your overall health, take steps to quit smoking! A sign of exhaustion that tend to get more intense with age, shadows around and under your eyes broadcast to the world when you’re feeling less than your best. One of the most important things you can do to help here is stay hydrated: this will help your skin overall as well as specifically reducing the appearance of these dark circles. Adding a moisturising eye-cream to your routine will address this problem area specifically and help you look like your alert best all the time!